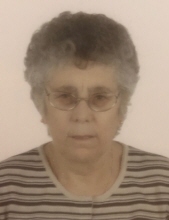 Maria Do Sameiro de Souza (Nee Fernandes) Alves, 69, passed away at New Vista Nursing & Rehabilitation Center, Newark, NJ on Saturday, March 23, 2019. She was born in Padreiro, Arcos de Valdevez, Portugal, came to the US in 1987, and resided in the Ironbound Section of Newark. Maria worked for Krementz Jewelry (Colibri Group) of Newark, NJ from 1987-1999. Wife of the late Augusto Coelho Alves; devoted and loving mother of Victor Manuel Alves and his girlfriend Maria Magdalena Musat; dear sister of Joao Fernandes and his wife Rosa of France, Armindo Fernandes and his wife Maria da Luz of Portugal and Adelio Fernandes and his wife Olivia of France; also survived by many dear nieces, nephews and cousins. The Funeral Services for Maria will be on Thursday, March 28, 2019 at 8:30am at the Buyus Funeral Home 426 Lafayette St.at Wilson Ave., Newark, NJ 07105. Thence to Our Lady of Fatima Church, Newark, where at 9:30am the Funeral Mass will be offered. Relatives and friends are welcome to attend. The visitation for Maria will be on Wednesday March 27 from 5:00 – 8:00 pm. To send flowers or a remembrance gift to the family of Maria D. Alves, please visit our Tribute Store. "Email Address" would like to share the life celebration of Maria D. Alves. Click on the "link" to go to share a favorite memory or leave a condolence message for the family.